For those REVITALIZATION readers who look forward to hearing good news from the Lower 9th Ward (the mostly African-American neighborhood of New Orleans, Lousiana that was almost completely destroyed by Hurricane Katrina in August of 2005), here’s some more. 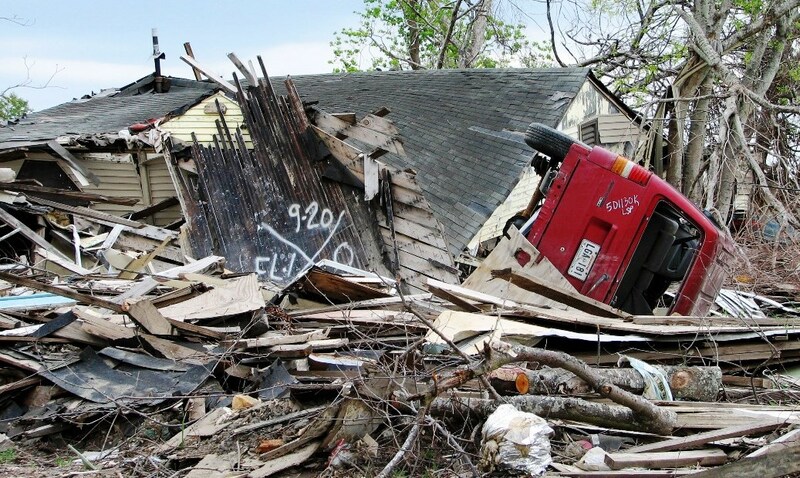 Lower 9th Ward immediately after Katrina. 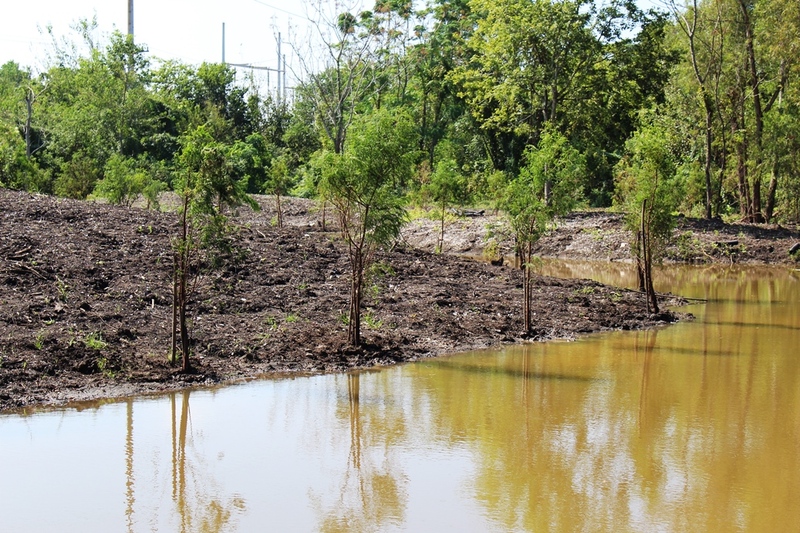 The Sankofa Wetland Park has just opened in the Lower 9th Ward. While it’s new, it represents a small-scale restoration of the ubiquitous native wetlands that were here centuries ago, before the U.S. Army Corps of Engineers diked the low-lying area and told people it was safe to live there. The Sankofa Wetland Park is a green infrastructure pilot project of the Sankofa Community Development Corporation (CDC)—in partnership with the Sewerage & Water Board of New Orleans—to transform 2 acres of a deteriorated natural area in the Lower Ninth Ward into an educational assimilated wetland park as the first phase of a larger trail system. Sankofa CDC is working with a project team of educators, researchers, community stakeholders, and public agencies to plan for the sustainable restoration of this site. 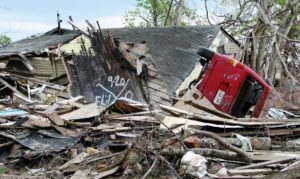 Improved conservation, hazard mitigation, and community investment are being addressed to contribute to improvement of the built environment and economic development in the area. The park’s construction was financed by a $100,000 grant from the Sewerage & Water Board as a green infrastructure project that was required under a 1998 consent decree with the U.S. Environmental Protection Agency over their unauthorized sewage discharges into the river, lake and urban canals. Sankofa worked with a team of wetland ecologists and landscape architects to transform this area into a space for environmental education, relaxation, and recreation for all to enjoy. 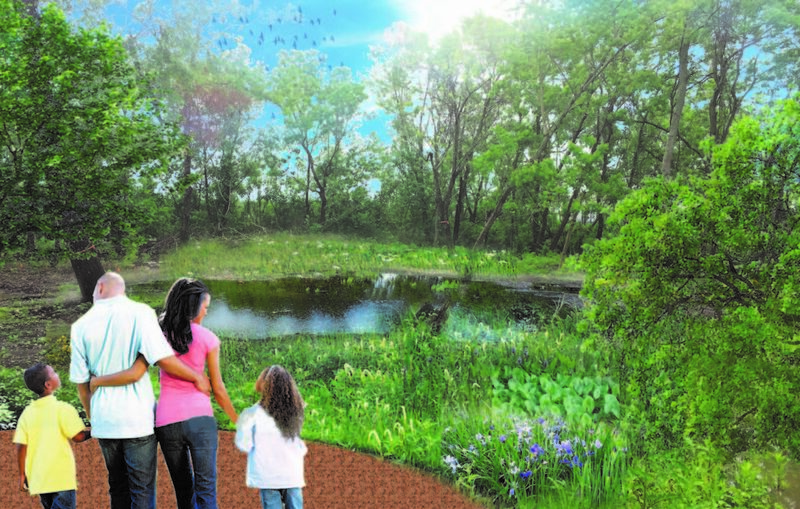 The park highlights the role of wetlands in absorbing stormwater and reducing land subsidence. Dry park property prior to restoration. It looks nice and green, but almost everything you see is invasive, and thus of little use to native animals. 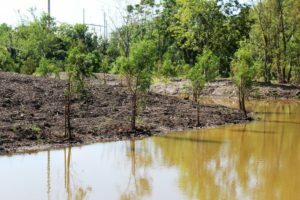 Over 300 Bald cypress and 200 herbaceous trees have been installed with 81,929 gallons of water flowing into the wetland area. 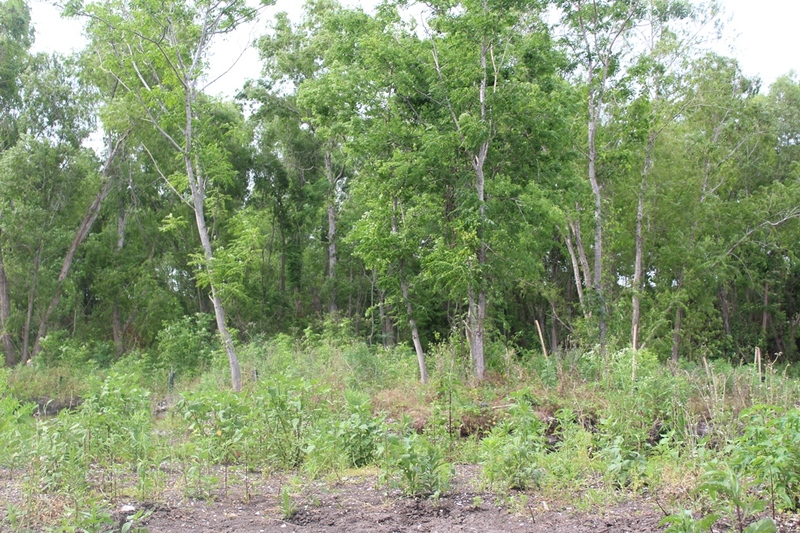 Over 400 invasive Chinese Tallow trees were removed from the site. 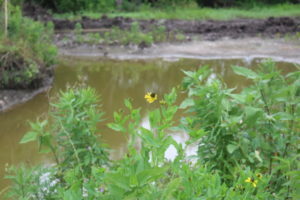 Wetlands create a habitat for plants and provide shelter and food for butterflies, birds and other wildlife. Trees cool the environment, clean the air and absorb rainwater. The trees, plants and wetland features in this park function together to slow and clean stormwater runoff. 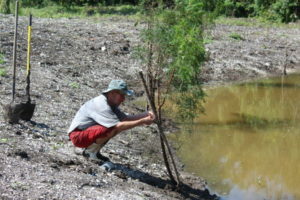 The groundwater is then recharged, which reduces the effects of land subsidence, which occurs when the clay soils typically found in New Orleans become dry and shrink. 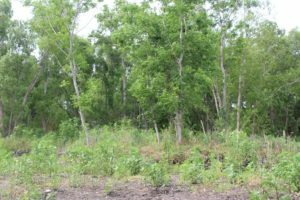 The Baldcypress and Water Tupelo trees planted on this wetland park stand strong during hurricanes and protect neighborhoods. In a great example of the 3Re Strategy (repurpose, renew, reconnect), local residents hope that repurposing and renewing this derelict property into Sankofa Wetland Park will be the first phase of reconnecting the neighborhood, which would do wonders to revitalize it. 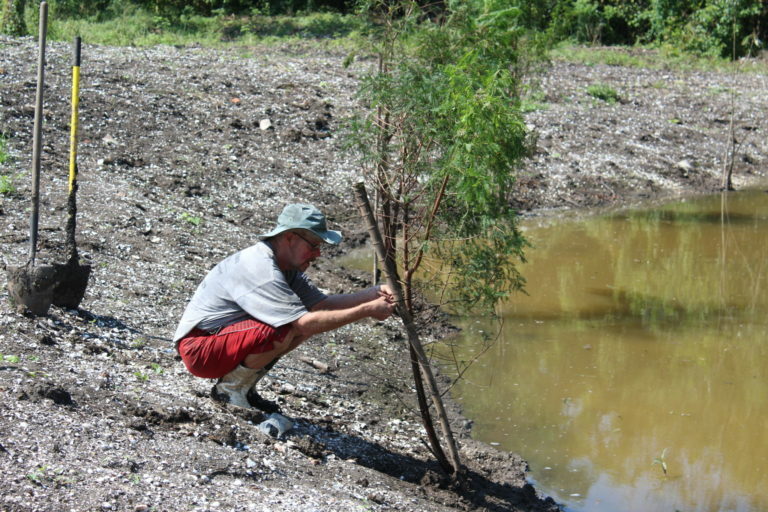 Park with restoration of water & native species completed. Now nature can take her course to turn it back into a thing of health and beauty. The non-profit Sankofa CDC was founded by Rashida Ferdinand in 2008, with the support of Lower Ninth Ward residents and stakeholders. It was initially incorporated as the Historic Lower Ninth Ward Council for Arts and Sustainability, and their first project was the Sankofa Marketplace, a monthly community hub for local growers, musicians, chefs, merchants, and artists. In 2010, the open-air event transitioned into the weekly Sankofa Farmers Market. In 2012 Sankofa started the Sankofa Mobile Market to increase access among food insecure communities, specifically seniors. The Mobile Market currently operates in four different locations across town. In August of 2014, Sankofa won the Lots of Progress contest and obtained seeding funds and land to open the Fresh Stop Market, Sankofa’s open produce stand in the Lower 9th Ward which opened in October 2015. In addition to the Fresh Market programs Sankofa operates a mini farm where they grow organically grown produce and herbs, Sankofa CDC creates opportunities in the areas of urban revitalization, youth enrichment, education, health, and economic development. Sankofa presently operates 3 days of fresh produce markets (including one mobile market stop in the Lower Ninth Ward), weekly healthy cooking and gardening classes, monthly community program planning sessions, 24,000 sq ft of urban farms, a weekly fresh food pantry, a market SNAP Match program, and SNAP enrollment services. Sankofa programs are sponsored in part by the Kresge Foundation, USDA (Natural Resources Conservation Services), AstraZeneca HealthCare Foundation and WK Kellogg Foundations. Sankofa is a member of the Kresge Fresh Lo team to support development of the Lower Ninth Ward through health, art, and equity. Sankofa recently moved into its new headquarters at 5200 Dauphine St. to provide health and wellness resources in the Lower Ninth Ward community. Sankofa is presently planning to build a teaching kitchen to provide a structured facility for healthy cooking classes at the new Sankofa Community Resource Center. All images courtesy of Sankofa CDC. See full article by Katy Reckdahl in The New Orleans Advocate. Green bonds + reforestation + renewables + oil cleanup = Nigerian restoration economy?